Goodreads Summary: Lately strange things have been happening to Daire Santos. Animals follow her, crows mock her, and glowing people appear out of nowhere. Worried that Daire is having a nervous breakdown, her mother packs her off to stay in the dusty plains of Enchantment, New Mexico with a grandmother she’s never met. 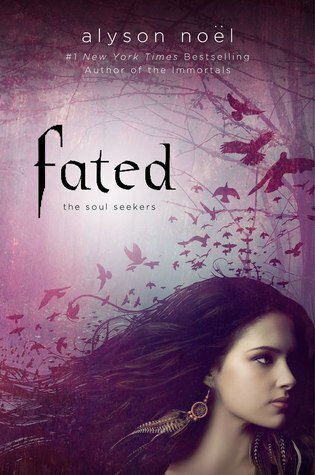 While I have not read Alyson Noel’s Immortals series (I have seen lots of mixed reviews about it), I was very excited to read Fated. The summary is awesome and the cover is gorgeous. Fated is a cool mix of South American and Native American mythology with interesting characters and a little romance mixed it. While Daire has always experienced interesting phenomena like stopping time for a few minutes, it’s on her sixteenth birthday that she has an episode in Morocco where she sees things and lashes out violently at the people around her. After several more episodes, her mother has to either have her committed to a mental hospital or send Daire to live in New Mexico with a grandmother she has never met but who promises to treat Daire with natural remedies. Daire grandmother tells her she is not crazy but descended from a long line of Soul Seekers, and while Daire responds to this new information with a healthy dose of skepticism, she begins to have otherworldly experiences that make her realize her grandmother was telling the truth all along. I love the Southwestern setting, it’s perfect for the mythology in the book. There are some very cool aspects to this story such as the way Daire descends into the Lowerworld and the spirit animals. I also really liked the portions of the book where Daire shifts her consciousness into various animals and insects, especially the cockroach. I like Daire. She has a cool sense of style and I love how tough she is and the way she stands up to the mean girls at school. I also like the secondary characters such as Daire’s grandmother and her friend, Chay. Daire’s mother is flighty, childlike and completely unaware of what’s going on with her daughter and even though I’m not a fan of absentee parents in YA books, the circumstances here are well done as Daire’s grandmother is very active in her life. Of course, there is a bad guy: the gorgeous Cade who just happens to have an identical twin, Dace. Cade and Dace and complete opposites: evil twin and good twin and not surprisingly, Daire falls for good twin Dace. I don’t really like the relationship between Daire and Dace. It’s not exactly insta-love because Daire had been dreaming about Dace before they ever met but their relationship is not exactly well developed either. Additionally, Dace comes across as being so good, he just seems naïve to me. Just like his brother and Daire, Dace also has powers and I feel he should have a clue about what his evil twin was up to. Despite my issue with the romance, I enjoyed the mythology in Fated and look forward to the next book in the series. Content: Kissing, violence and underage drinking. Yeah I've heard some negative rings about this book. I think I'm finally sick of paranormals, so I'm probably not going to read it. I really enjoyed this book but I agree about her relationship with Dace. I felt like it could have been more developed. Great review! It seems like people who've read Noel's Immortals series didn't like Fated, and people who haven't read Immortals do like Fated. Just something I've noticed in reviews for this book! This sounds a little like Wild Magic by Tamora Pierce, just cause the main character, Daine, in Wild Magic can shift into animals too. Even the names are similar! I really enjoyed your review, I miiiight just pick this up after I finish the Immortals series. I didn't really love this book either! I was not a fan of the romance but I did love the setting. However I thought the author has a good writing style and I really liked the concept. I think if the romance was written better or not such a big part of the novel I might have enjoyed Fated a lot more. Thanks for the honest review. I agree with you 100%! I've seen a bunch of negative reviews of Fated - a lot of stuff about Fated having seriously similar plot-lines to this book and that book, and multiple different books. I totally agree with you about the absent parent thing. It occurs a lot in YA, doesn't it?